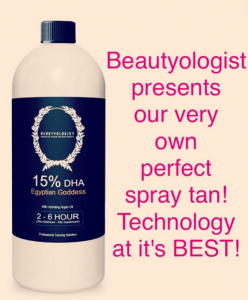 We are so proud to announce, Beautyologist’s very own spray tan!! A 2 hour liquid, packed with natural ingredients, 3 different shades. No alcohol, no parabens, and no orange pigment! Fast drying with hydrating Argan oil for a longer lasting tan!